Greetings! You are most likely looking for Alternatives to Socrative. 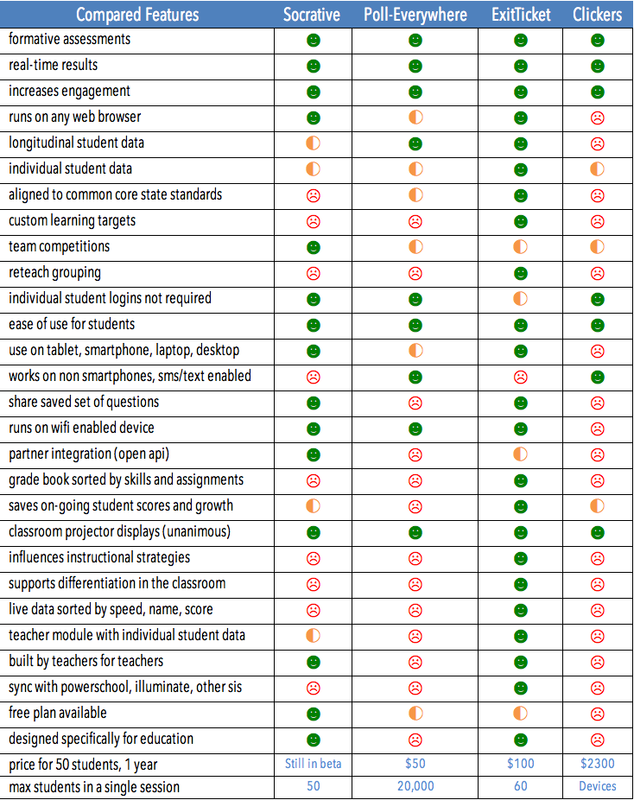 We have compiled the top Socrative Alternatives in an easy to disseminate comparison. I hope you enjoy this review and comparison and find the solution that works best for your school. Schools everywhere are moving to a 1:1 ratio of students to WiFi devices. Educational technology is in our classrooms. Visiting schools, you are likely to see a student use an iPad, iTouch, iPod, Chromebook, Android tablet, or laptop in almost all of their classes. But why? What is the point of all of this technology? One of the biggest answers is the adoption of student response systems (SRS). Questions go out to students and they buzz in their answers. Results are instantaneous and teachers can do a lot with this type of tool. In the past, teachers had to buy every student a “clicker,” but remotes as a class SRS are becoming less common as WiFi devices become more available. This site is devoted to a review of some of the top SRS solutions: Socrative, PollEverywhere and ExitTicket. But how do you choose the best solution for your School? When you are looking for a student response system for use in your classroom, you should first consider your environment. Bring your own device (BYOD) initiatives often require very flexible apps that work across iOS, Android, and Windows simultaneously. Speak with your school or district’s Director of Instructional Technology about funding and technical specifications. And when you start shopping for a SRS, keep in mind some of the features needed in a true, 21st Century learning environment. An SRS lets you take the pulse of your class’s. You can check for understanding in a flash. That’s the idea of a formative assessment. But that data should be kept, saved, studied and used for feedback and grading. You need this in order to quickly modify teaching and learning activities to improve student attainment. Results should be in real-time, visible to you as the teacher right as the student responds. And the students should be able to see if they’re right or wrong right away. It’s so much harder to reteach a misunderstood lesson than introduce a new concept. Immediate feedback helps prevent misconceptions. The potential of our students is astounding, but capturing their attention and getting them to participate with a concerted effort is always a challenge. A student response system needs to help connect with students and increase their incentive to join in the activity. Quick assessments are great, but it should track longitudinal data to see how the class, and every particular student, is growing too. The system should be tied to learning targets, including the CommonCore and various state standards. Teachers are under more pressure to address these standards. If I’m going for a new assessment tool, I want one that will link up to the legally required standards. Should be easy to arrange students into groups for differentiated instruction. Some students need more scaffolded instructions where other students need more challenging assignments. You should get a system that lets you group students and seamlessly address multiple sets of needs. Students should be able to log in to see their results, achievements, progress and track their own mastery of the concepts. An easy way for new teachers to become great teachers quickly is to get professional development from mentors. Sharing formative assessments from master teachers is a great way to have help developing your pedagogy. A SRS needs to facilitate professional collaboration. Game mechanics are designed to motivate and shape behavior. Competition and recognition increases buy-in from even the most reluctant students. There should be a free trial and a free plan to fall back on if you don’t decide to buy the application. After all, this is for student benefit, right?